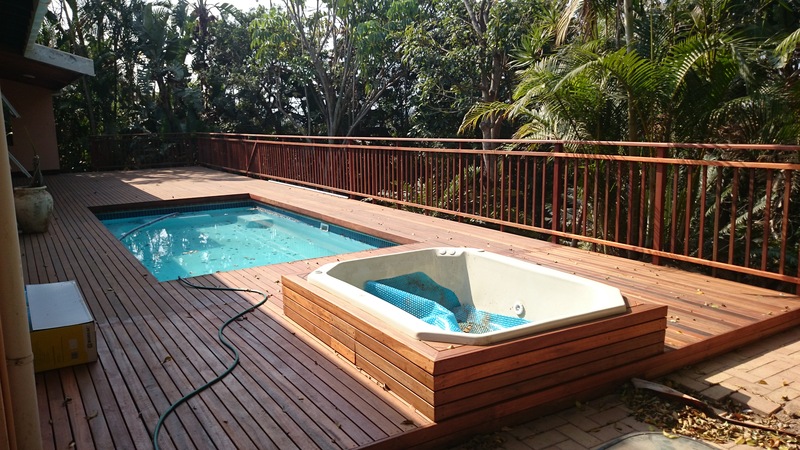 This wooden deck we built for a client in Umhlanga, Durban was a suspended wooden deck about 2.8m off the ground. The idea was to make use of the flat concrete roof as a deck because the views from up there are of Durban Anchorage where ships anchor before proceeding to Durban port. The views also extend all the way down the Golden Mile of Durban. We didn’t want too many posts going to ground as the area beneath the wooden deck is still used as an outside patio. So we built our substructure using H4 CCA Treated pine in a 50 x 228 size rather than the normal 38 x 114. 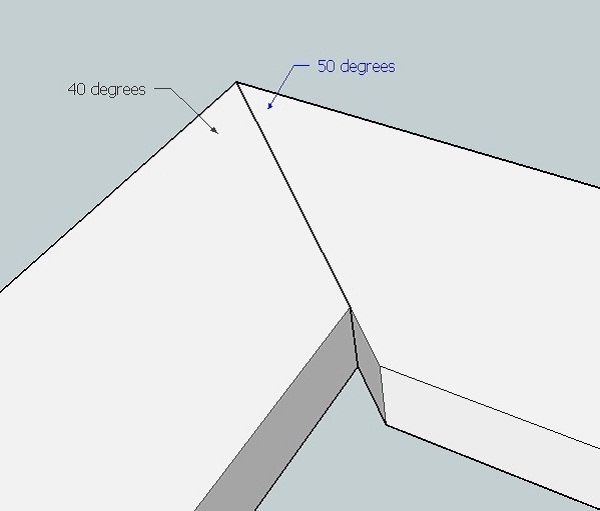 This way we could span our wooden joists of the deck across a longer distance without the need to support them below with another beam, and therefore posts. We attached the one end of the row of joists with a T joint to another 50 x 228 beams which carried the one side. The other side of each joist was hung in a custom-made galvanised steel joist hanger. The result was that our entire substructure was in one plane rather than having the joists sitting on top of a beam. It allowed us to keep the ceiling height of the deck higher, without having to increase the height of the top of the deck surface. These pine wooden joists were later sanded and sealed to make them look closer to the balau we installed on top of the pine. The wire rope balustrade was fairly straight forward and we extended it past the deck on to the concrete slab flat roof. The challenges in this wooden deck came in building the stairs. We had a fixed height to work with and a limited lateral distance in which we had fit all of our treads and risers whilst still keeping our risers and treads compliant. To add to this we had a window we had to pass to get down quick enough in our stair case in order to miss the window, plaster band and plumbing on the side of the house. The only way possible was to split the staircase into three flights with two landings where the flights turned at 90 degrees. We also had to split each landing into three windings in order to gain an extra two risers per landing in order to finish the stairs where they needed to finish. We adjusted the tread depth to shorten our treads and therefore total lateral distance to basically “sqwish” then all in. Normally we use 3 pieces of 30 x 102 balau for treads with two 5mm gaps between boards resulting a tread width of 316mm. We ripped the middle 30 x 102 to 50mm to reduce this lateral distance whilst still remaining compliant at 264mm but gaining some lateral distance in order to squeeze them all in. We finished it off with balau deck board cladding in order to cover all the pine structure. The job took time but it was well worth the wait. Stairs that look nice, work nicely and remain compliant. It was all finished with an oil based sealer which penetrates the wood rather than drying on the surface. Contact us for quotes on your wooden decking, stairs, balustrade and other outdoor timber construction. You can call us on 031 – 762 1795 or you can use the contact us form below. 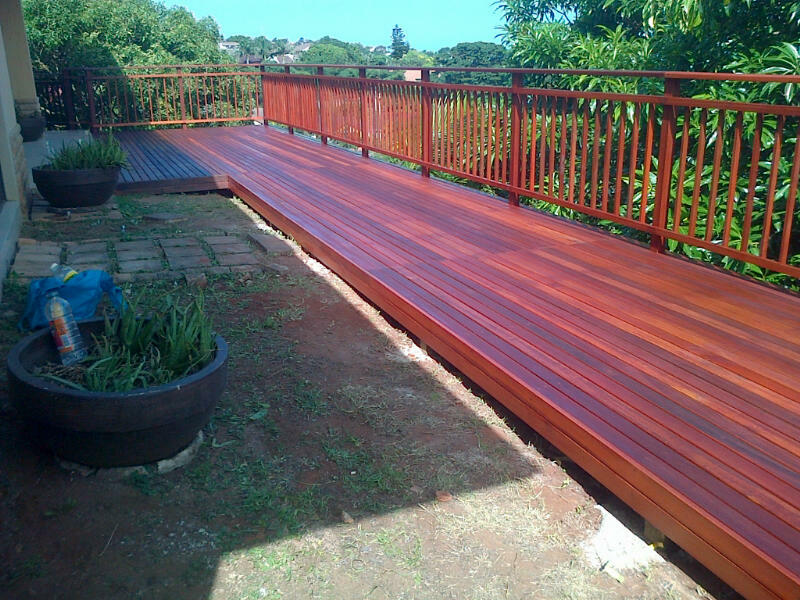 Here’s a wooden decking project we completed in Hawaan Forest Estate, Umhlanga, Durban. There were two houses right next door to each other so it was a bit easier on the pocket when it came to travel to site. The whole job was quite big too, in excess of 200 square metres of coverage, so it was worth the travel from Home Base in Waterfall, Hillcrest. House 1 consisted of a fairly large deck of about 80 square metres. It was an interesting deck to build in that it was built flush with the tiled covered patio, extending to the pool, with steps as wide as the deck leading into the garden. It incorporated a fire pit with step benches on three sides set slightly away from the pool. The front of the steps were clad so that beneath the deck was not visible. 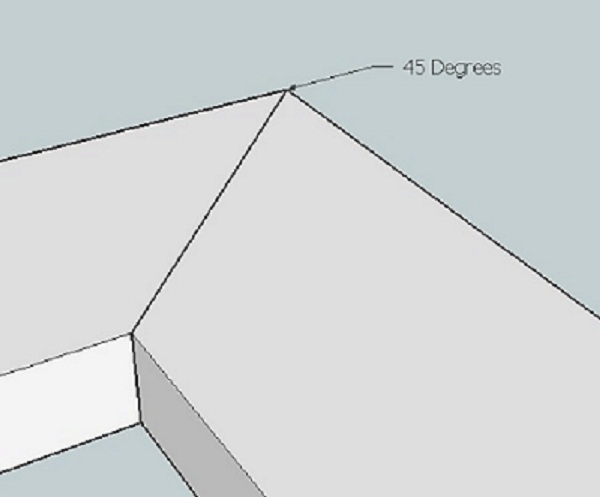 We met our deck boards at a 45 degree angle on the vertical cladding. There were various smaller decks around the front of the house and the courtyard consisted of a steel frame and steel gate clad in balau deck boards. There was an interesting deck on the first floor of about 7 square metres that is accessed through a door on to the roof top. It is bordered by three sides of planter boxes surrounded by balau. The garage doors were 6m wide and 2.7m high. The frame was made of steel and deck boards were used to clad it. It resulted in it being quite heavy but complimented the front of the house by following through with the wood cladding design so typical of Hawaan Forest Estate homes. Along the front of the first floor are steel sliding screens of 14m x 3.1m high. The decks and courtyard screens were all done in 19 x 68mm balau reeded deck boards whilst the sliding screens on the first floor were done in 19 x 30 balau slat. In order to get a 19 x 30 slat we ripped a normal 19 x 68 deck board in half to 30mm wide. These were then attached to the steel with a 20mm screw from behind so that no screw holes are visible from the front. Most deck boards are reeded on one side which allows water to dissipate more easily between the deck board and joist, so we had to source non reeded deck boards for this application. If it had been reeded the grooved side would have been visible from either the inside or the outside. Non reeded deck boards are not that common, but they are available, and it is cheaper to rip deck boards to 19 x 30 than to buy 20 x 30mm slats. House 2 had a much smaller pool deck of about 25 square metres. It was fairly intricate though in that the deck had to be tucked underneath the wall on one side and beneath the tiles of the pool fascia. The patio above the pool had a fall to it to allow water to run off, so the edge of the deck could not be level, otherwise it would have resulted in a stepped join between the wooden deck and the patio. There are also a few smaller decks surrounding this house and it too has a 13m long by 3.1m high sliding screen system in steel with balau 19 x 30 slats. I will update these pics above once other contractors have completed their areas of work to give you a good idea of what is possible in timber decking and screening. 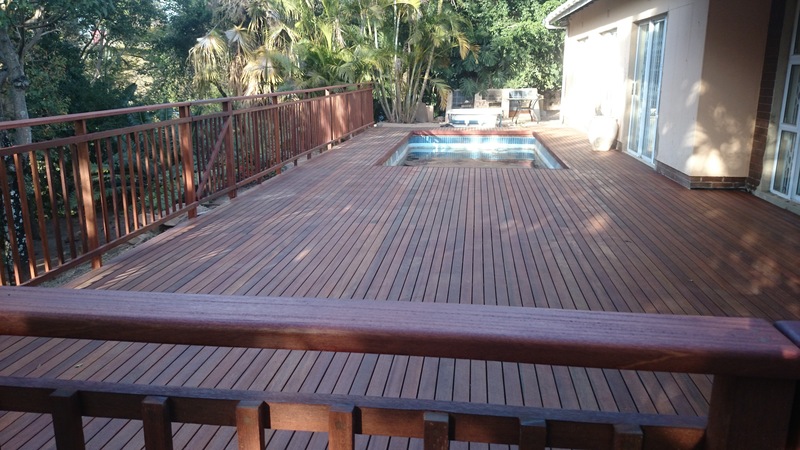 For a quote, and design, of your wooden decking and screening requirements, please call us on 031 – 762 1795 or use the contact us form below. As I’ve mentioned in previous articles we use a H3 CCA treated pine substructure which the suppliers offer a 50 year guarantee on. In order to activate that guarantee we need to adhere to best practices and there are a few things that we need to do, and document by way of pics. Although all decks we build are built according to best practices, when applying for a guarantee we need to document it. So if you require a guarantee please let us know beforehand so we can collect all the documents we need to process it. These include charge sheets and retention records from the treatment plant to ensure that the chemicals used in the treatment process penetrated the timber properly. The charge sheets also document all sorts of things such as how much solution was added to the chamber, how much wood was in the chamber and how much solution much was left over. From this one can work out what the penetration was and can be verified through the retention records. When the wood is treated it is placed in a chamber and all the air is sucked out to create a vacuum. Solution is then added to the chamber which now takes up the void or vacuum and the solution is sucked into the timber. They call this pressure treatment. CCA is an abbreviation for Chromated Copper Arsenate. 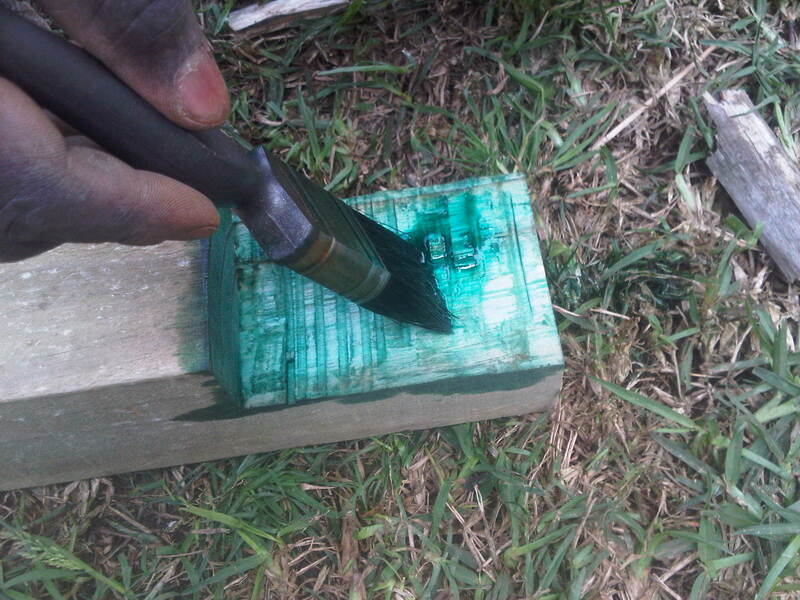 The copper stops fungus growing on the wood, which in turn causes the fibres of the wood to break down and rot. The arsenate stops insects from eating it and the chrome binds the two so that they don’t leach out of the wood. 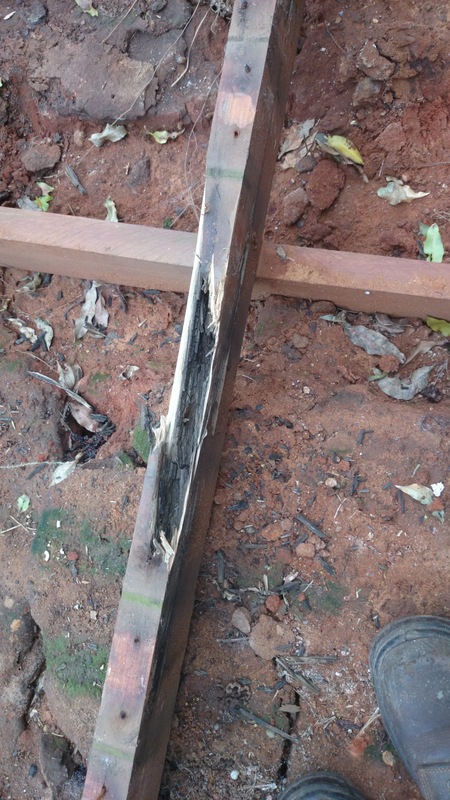 There are different hazard classes of CCA treated timber. For a full explanation you can visit http://www.sawpa.co.za (South African Wood Preservers Association). Once this pine has been treated it can now get wet without the fear of it rotting because the fungus cannot grow. It is not water that causes rot, but rather fungus. The water allows the fungus to grow which breaks down the fibres of the wood which causes rot. So now your wood can get wet without rotting. When the wood is treated, this CCA solution they use penetrates the timber based on the pressure they use and the time it remains in the chamber. The longer the time, the greater the pressure and the stronger the solution, the higher the hazard class and more resistant it is to rot and insect infestation. 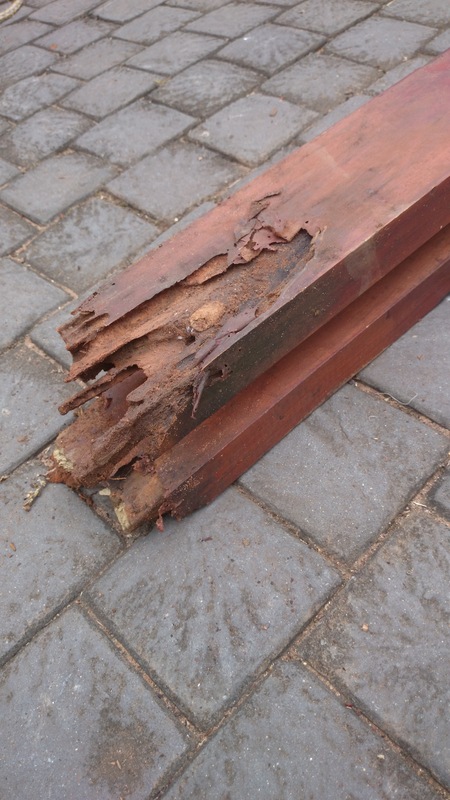 So timber being used outdoors subject to weathering (rain and sun) needs to be of a higher Hazard Class than timber being used in your roof where it is protected from rain to a large degree. The depth of the penetration is subject to the density of the timber (pine vs. saligna or gum), and the time in the chamber. These retention records mentioned above are obtained from coring a section of the timber on each batch to ensure that the solution penetrated the timber properly. The charge sheets will outline how long the timber was in the chamber, the strength of the solution etc. 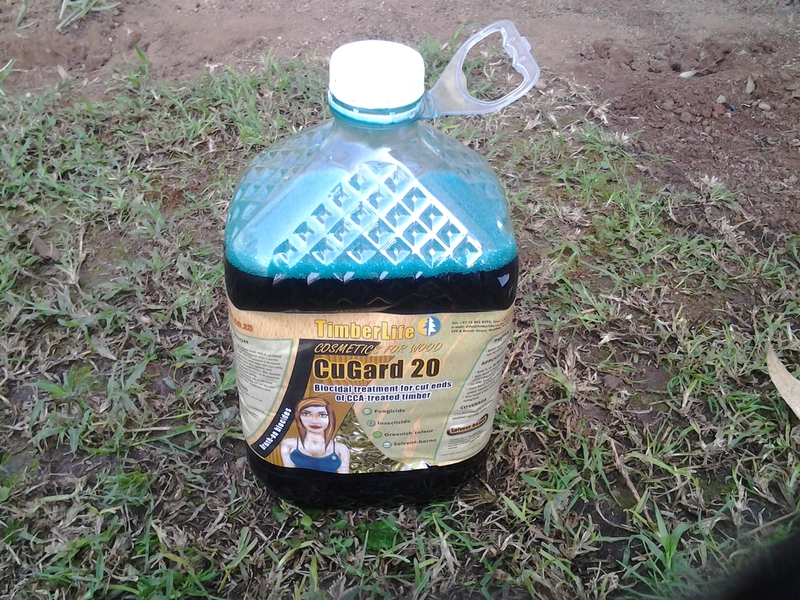 So once all these documents have been collated, one can apply for a guarantee from the suppliers of the solution used in the treatment process. One last criterion is that where we cut a piece of timber we need to treat the end grain with an end sealer approved by the supplier. This is because the solution used in the treatment process does not penetrate all the way through the timber. Depending on the density of the wood it will penetrate about 16mm into the timber. With pine, as opposed to saligna, it will obviously penetrate further as the timber is softer. Timber such as balau cannot be successfully treated as it is too dense. However it rarely needs to be treated as it is naturally resistant to insect infestation and rot due to the resins and oils naturally found in the wood. 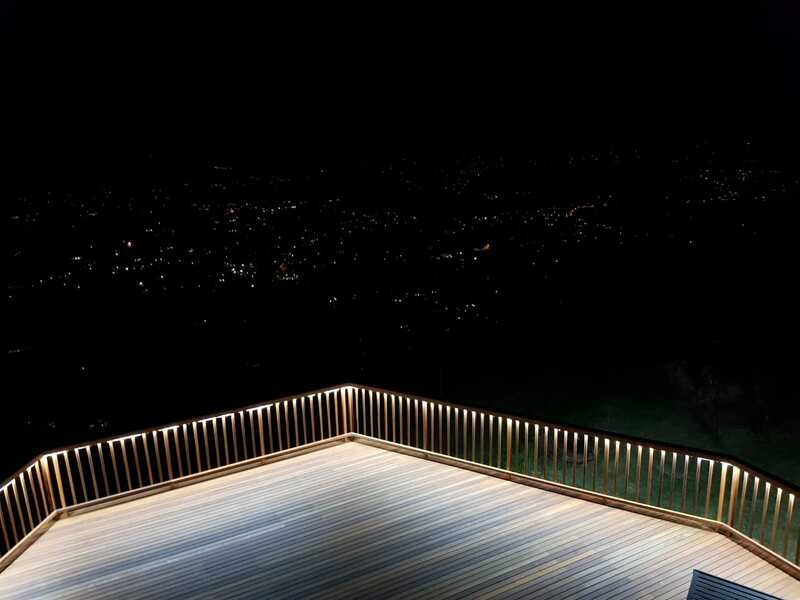 By following the manufacturers and SAWPA’s guidelines one can successfully use treated pine as suitable outdoor timber for decking. The pictures alongside show where we have used an approved end sealer to treat the timber on all cut ends. 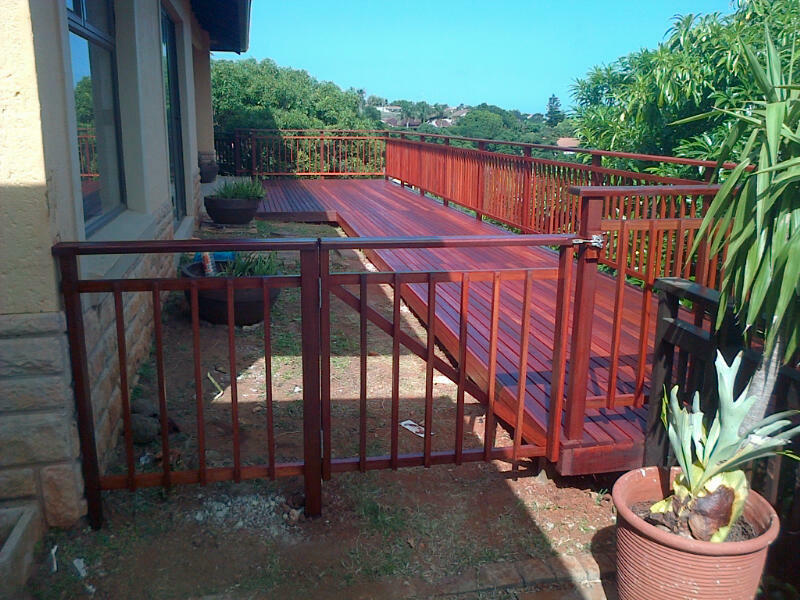 For a free no obligation quote on your decking and other outdoor requirements please contact us on 031 – 762 1795 or use the contact form below. 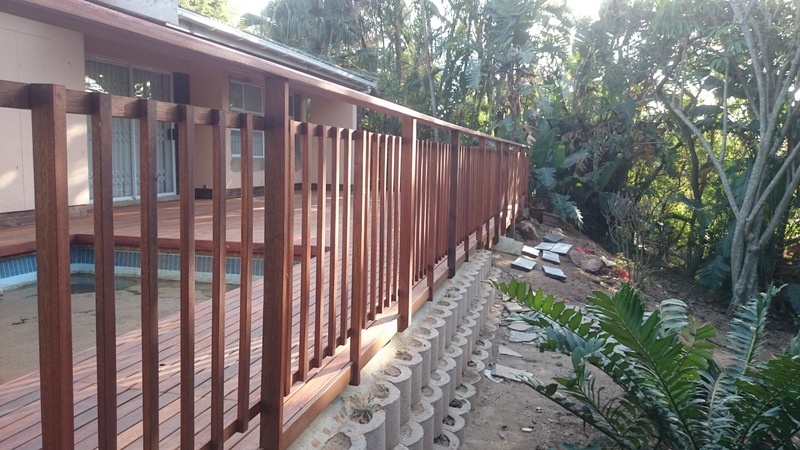 This existing timber deck in Umhlanga Durban had reached a point of no return and our recommendation to the client was that we remove it and replace it. It’s never a good thing to hear that you must throw it away and buy a new one because it can’t be fixed, but often wooden decks are not built as they should be built and they therefore do not last as long as they should. From the picture alongside you can see the damage done to the posts at ground level as a result of insects. Given another year or so and those posts would have failed and although the deck might not have come falling down, it would have become unsafe and a danger to those trying to enjoy it. See far below for pics of the finished product. The existing deck had been built out of pine and I can only think that the wrong H class was used. 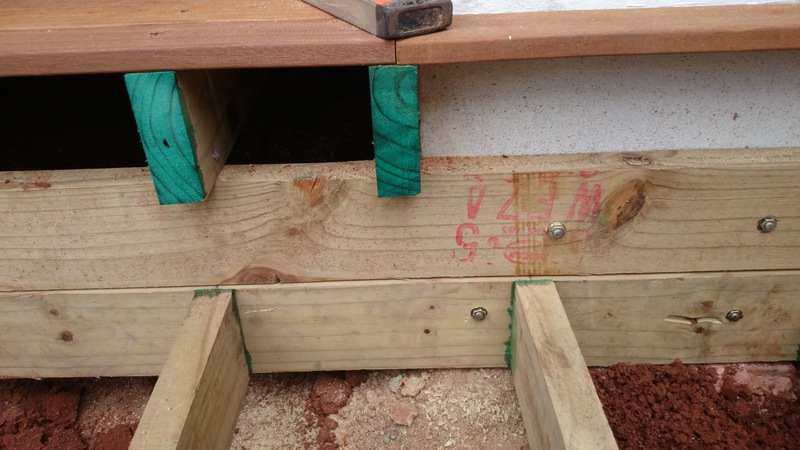 As I’ve mentioned in other articles, pine used for decking purposes needs to be CCA treated to at least an H3 level and any pieces in direct contact with the ground should be treated to H4 level. You can read up more on the H levels here http://www.sawpa.co.za. In a nutshell though, off the shelf H2 treated timber will not last. And don’t be fooled by the timber yard telling you they will “double dip” it. The pressure between H2 and H3 treated timber is different, so doubling dipping H2 will not make H3, it will make H2 + H2 and it WILL rot. On the other hand if the correct H level is used the suppliers will offer up to a 50 years guarantee on this timber against rot and insect infestation. Who’s building a deck that will still be around in 50 years? We first removed the existing deck boards so that the joists were exposed. We removed all joists but left the main beam on the front edge so that we could use it as our guide to installing the new beam. We used the existing posts as temporary posts to build our substructure, then installed our new beam and dropped posts to ground from there. We then removed the old beam and old posts and were left with a new timber deck substructure in pretty much the same place as the old one. It made our life easier and took a lot less time. There was a gate we built and installed along the one side. We used stainless steel hinges on it. I’ve found that stainless steel hinges with bearings in the spine are not that costly. In fact a lot less expensive than brass and, in my opinion, a lot more durable. The solid brass can sometimes be a bit soft whereas stainless steel is a lot harder. This is especially the case when talking about screws. Brass screws tend to sheer of quite easily under pressure. It was a nice job to kick the year off with as it was relatively simple. The only hurdle was trying to build 3m in the air on a very steep slope. We used extension ladders but still it makes it difficult and a bit slower because someone has to hold the ladder and keep moving it when screwing down pickets on the balustrade which is time consuming. 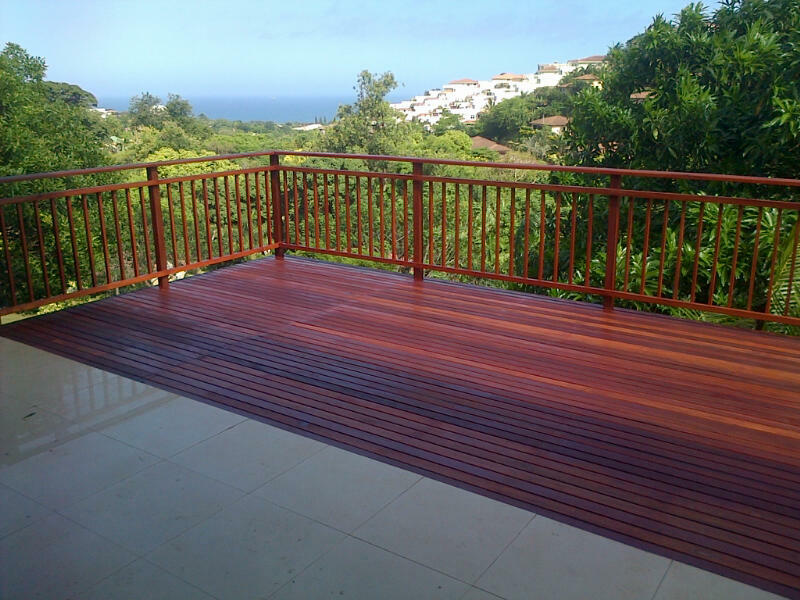 For a free, no obligation quote on your timber decking and other outdoor timber construction needs in Durban please call us on 031 – 762 1795 or use the contact form below.